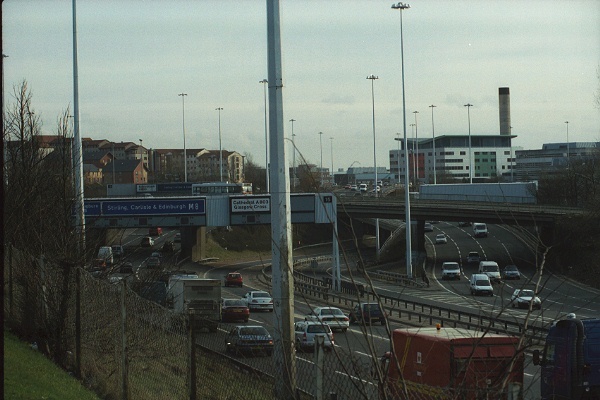 The present M8 through Glasgow was just one line through an planned urban motorway network. 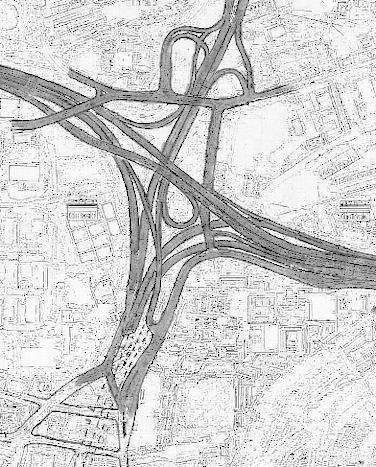 It was intended that there be a complete Inner Ring Road around the centre with six or seven radial motorways leading out in various directions. 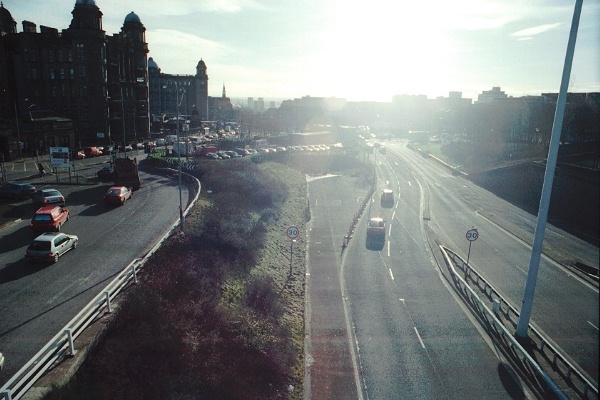 J15 was key to these plans, and was intended as the NE corner of the Inner Ring Road, with the Ring Road running south from the junction, and the present M8 running as just another radial route to the east. What should have been a simple triangular junction between the three motorways is complicated by the A803 dual-carriageway running in from the north, with direct access the Inner Ring Road in both directions, but not to the M8 eastwards. 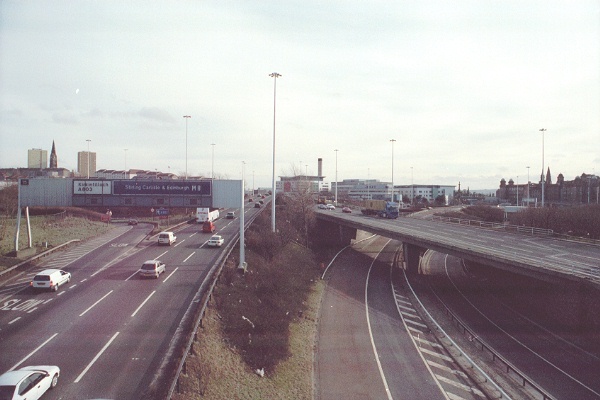 There are also three major surface streets running through the interchange. The A8 runs close around the SE corner, the A804 runs E-W across the north side, and a link road joins them, apparently also numbered A803. Access to and from the surface streets is possible in all directions. 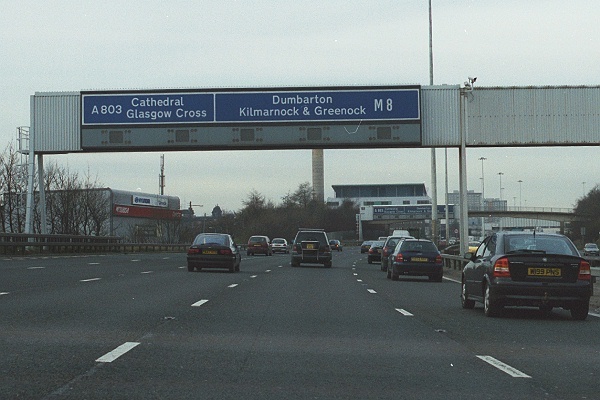 The M8 here has a right-hand exit eastbound and a right-hand entry westbound. 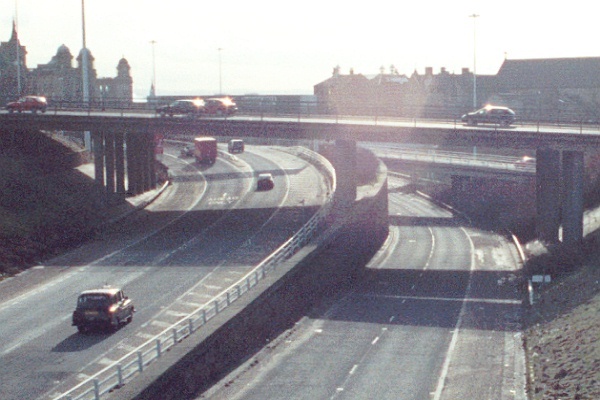 As originally planned, the M8 would itself have been a left hand exit from the Inner Ring Road, probably with two lanes (plus hard shoulders) going in each direction. 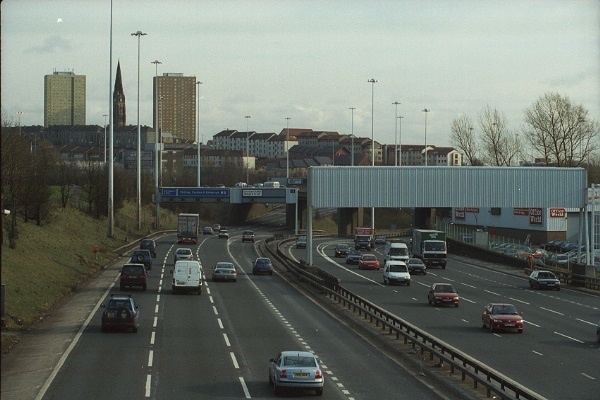 The slip roads curve steadily to the right, passing underneath the westbound M8. 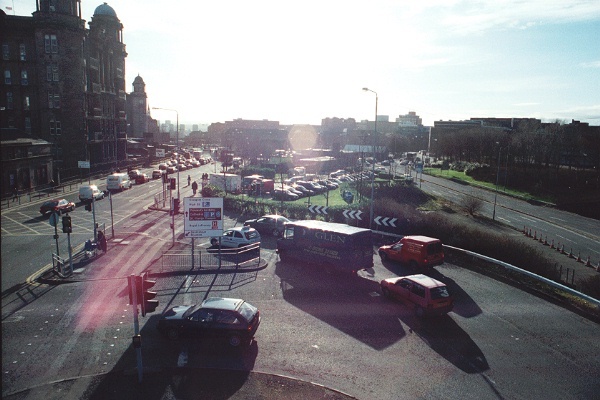 The A804 crosses diagonally over the intersection in the foreground. View east from the A804 bridge. 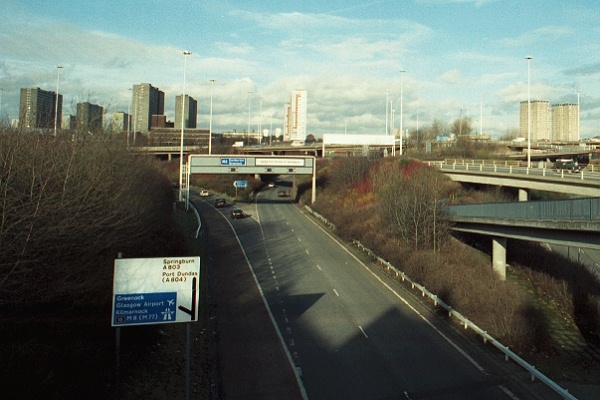 The slip roads curving under the westbound M8. The eastbound slip can be seen beyond, climbing to the south, while the westbound climbs out from under the gantry sign at the right of the picture. From the widths of the hard shoulders and hatched area on the central reservation, on the slip roads, it's evident that both sides were intended to carry more than one lane of traffic - probably two lanes each way, plus hard shoulders. At the far left of the picture is the second eastbound exit at J15, leading to the northbound A803. J15 looing south from the A804, with the A803 underneath and the M8 crossing above. The ramp on the right is from the eastbound M8 to the northbound A803, and is crossed at right angles by an exit from the northbound A803! Close-up of the same view. The southbound A803 splits, with the left lane going round a loop to join the westbound M8, and the right lane joining the exit from the eastbound M8. 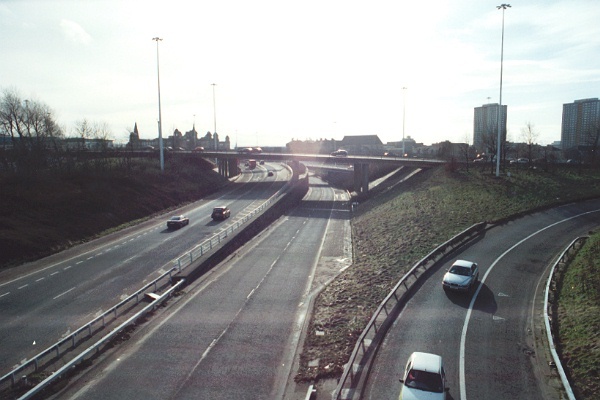 The northbound A803 is at a lower level, with its exit to the westbound M8 just visible under the far bridge. The M8 motorway crossing over the top has no hard shoulders, but the A-class road underneath does! The exit from the eastbound M8, having been joined by the southbound A803, ends abruptly with this sharp left bend and traffic lights. Below and to the side is the exit from the westbound M8, which finishes just as abruptly. The carriageway is slewed sharply to the right with a line of cones and fed onto a surface street. It's very clear from this picture that the motorway was planned to extend south of this point, with the eastbound slip joining it smoothly. 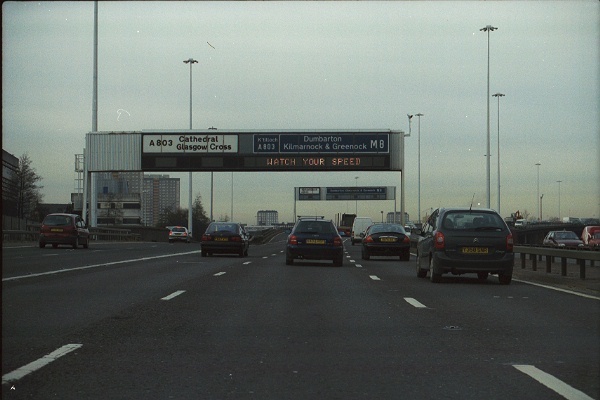 To the right of the photo, the two lanes just beyond the 30 sign are the slip road onto the eastbound M8. The two lanes at the far side (partly in shadow) are the northbound A803 and leading to the westbound M8. 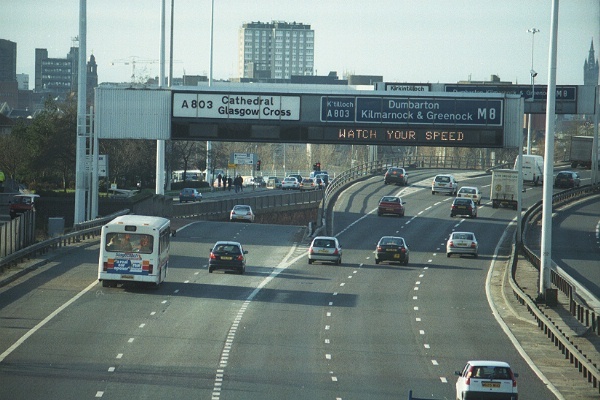 Looking north over the northbound A803, with the slip to the westbound M8 leaving on the left under the gantry sign, and the slip to the eastbound M8 passing under the bridges to the right. The nearest bridge on the immediate right, with the dark grey railings, is a footbridge. In the background, the massive grey blocks of the Sighthill housing area, currently home to many asylum seekers who are being housed in Glasgow until their cases are decided. Approaching J15 from the east, the two lane exit for the southbound 'motorway' peel off first, followed by a single-lane exit for the northbound A803 and Kirkintilloch. Access to the northbound A803 has to be done via surface streets. Note that three of the small matrix displays have been replaced by single long VMS display. The new display can still show the old matrix signs, in the correct positions, when required. All VMS panels in Scotland are always on - normally showing different road safety messages like this. The same scene from road level. The second exit is very sudden indeed. The previous gantry signs give no indication whatsoever that there's a second exit from lane 3!